paid for signs like these too. 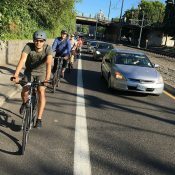 As the former City of Portland Commissioner of Transportation and current Member of the U.S. House of Representatives, Earl Blumenauer (D-Portland) does not take criticism of bicycling lying down. Blumenauer’s office, working on facts provided by the Portland Bureau of Transportation, issued a response to allegations made yesterday by Senator Tom Coburn (R-OK) that a federal grant for bikeway signage in Portland was “wasteful.” In his Waste Book 2010 report Coburn mischaracterized the signage project, claiming that $900,000 was spent on bike network wayfinding signs when similar signs were already installed. Wayfinding signage was a small percentage of the total funds allocated and expended. The City also removed some existing crossing signage and reinstalled it to improve visibility at existing crossings. Total for all signage (wayfinding and safety) with sign posts and footings was $69,180. New wayfinding signage was placed in areas without existing signage. 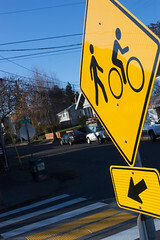 The City will have constructed an additional 30 miles of new bicycle boulevard facilities in two years by June 2011 – the ARRA grant provided for the necessary wayfinding and crossing signage for these new facilities. New wayfinding signage altered the existing design by making the destinations (words and distance) larger and reducing the size of the bicycle symbol. The destinations and distance are the most important information on the signs. Existing signage was left in place – new signage is not duplicative but installed in areas that lacked signage. MUTCD standard pavement markings (sharrows) were the highest percentage of total funds allocated. Other costs included engineering, project management, contractor compliance for pollution control and erosion control, contractor mobilization and traffic control. Blumenauer for president. The more I hear about that guy, the more I like him. If we had more representatives that valued bicycling/alternative transportation, we’d be healthier, safer, happier, greener, and less wasteful. This post fits in perfectly with today’s trailsnet blog topic. Rather see Bernie Sanders (S-VT) run for president, myself. I agree. I interviewed Blumenauer as a journalism student at MHCC more than 30 years ago. (I think he was on the Board). Only politician I’ve ever interviewed that didn’t talk in circular reasoning and add a lot of obvious “spin” to his answers. Lets see if the local news runs with the rebuttal the way it broadcast the lies by Coburn. thanks bikieboy. you’re right. that does look wrong. I’ll look into it and make the correction if necessary. Truth that Republicans don’t want you to know, thanks to Blumenauer for getting the facts out, I also hope they get press coverage. Coburn cleverly overlooks waste in how Oklahoma has spent stimulus funds in his paper, right wing television and radio gets lots to blabber about….mission accomplished. I have said it before and I’ll say it again, I’m so glad that Blumenauer represents me and my district. Good work Earl B. Unlike Coburn’s initial claim, those costs are totally reasonable…with the exception of $480k for sharrows. Does that seem a little steep to anyone else? Depends– How many sharrows were installed for that price? dan – That’s about $200 per sharrow. Seems a little steep to me, but there’s probably some buried costs in that which we aren’t seeing. Sharrows only recently have been standardized (Mia Burk talks about it a bit in her book, “Joyride”), so some (perhaps much?) of that cost is systemic – i.e. for the program itself, rather than the installation cost per sharrow. If Roger Geller or someone else from PBOT has any details on that and is willing to post them, I’d love to know it. Trucks and crews have to roll out for signs as well as pavement markings. Signs, posts and footings are definitely expensive, so there is a discrepancy somewhere, or yes, $200 seems steep. You might want to price it out yourself sometime…remember, you can’t really take shortcuts and cheap out on the poles, they have to last for decades. We’re talking something close to Schedule 40 oilfield pipe. 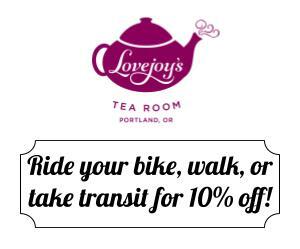 I’d love to see some media coverage of this, but I think we all know that KATU is too busy setting up a reporter in a chair in an East Portland bike lane to cover relevant facts. Nice to have the cost breakdown, however wayfinding signs at $20/ea (materials and install) must be an error. Try that x10 per sign installed. 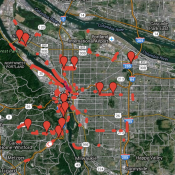 Blumenauer and your staff….nice work. Good on you too maus, for getting the info posted here. What’s wrong with that Coburn? Sure, blowing up examples of mis-spending when they occur, as an offensive strategy against opponents is understandable, but something like Coburn has done here with his bleep about ‘such and such amount of money spent on some signs out in Oregon’….getting almost completely wrong, leaves him looking like a nitwit. $200 apiece feels like it’s in the right ballpark, but did we really need that many? There are multiple sharrows per block on the Lincoln bike boulevard…one per block or one every 2 blocks would have been sufficient. To be honest, I don’t feel like drivers there needed to be reminded that they’re sharing the lane with bicycles: in 5 years of commuting on Lincoln, I haven’t had any significant issues with motorists. again, PBoT has used these sharrows as in effect wayfinders on sidestreets, rather than for their intended purpose, which is lateral lane positioning on somewhat more heavily traveled streets, but in order to get the stimulus money they had to use something that was at least nominally MUTCD compliant. Personally, I think *more* sharrows would have been better, at least at places where you need to make a turn in order to stay on the bike boulevard / neighborhood greenway / whatever street. One annoying aspect of this is that it takes so little effort to publish inaccurate information for the sensational “sound bite” (Coburn) but much more effort to produce accurate information for the correction (Blumenauer). Cheers to Blumenauer for the effort. drivers routinely have fits when i refuse to let them pass while descending at or above the *posted* speed limit. i don’t understand this kind of diffidence. 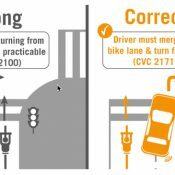 i want drivers to be reminded that they’re sharing the lane as often as possible. To clarify, in my experience, motorists’ behavior has not been such that I feel they are unaware of/unready to share the road with bikes on the Lincoln bike corridor. I don’t know how a bicyclist could stop a car from passing on the downhill: even if you ride in the middle of the lane, they can still get around. I would not hug parked cars to let a motorist around if there was also oncoming traffic, but if it’s just parked car, bicycle, and overtaking motorist, there’s plenty of room to go around. i hug the middle on salmon and clinton. this also works for upper lincoln. 2nd that, go EARL, Thanks for Representing! I guess my point is that more sharrows (where there were already some on the road) doesn’t seem like the best use of money from a “injury reduction per $” viewpoint. 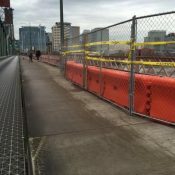 I would have liked to see some of that $480k spent on putting barriers between bikes and cars on the Hawthorne Bridge. I have had one or two hair-raising experiences heading eastbound. You’d THINK that Oklahomans, now free from worrying about sharia law, would have time to investigate these issues a little more carefully. One thing that most folks missed about State Question 755 is that, while it was heavily advertised on the whole Sharia/international law thing, is that it also covers treaties. This was really a pretty good attempt at screwing over the Indian nations that comprise the vast majority of Oklahoma’s territory. Especially since they all only speak the Queen’s English now, too! Don’t confuse Coburn with facts,it makes a better soundbite for Faux Nooz to mistate the facts. Blumenauers reply might be more factual, but undoubtedly will never be heard beyond Oregon. Right, Fox News will report Coburn’s report for days, I’m sure they will not find Blumenauer necessary to report or comment on. That is their definition of “fair and balanced”. The sheep will lap it up,…. suckers. Funny how “Dr.” Coburn’s report doesn’t mention ANY waste in defense spending. What a crock. Is there an update on the pictures being stolen? Keep it up, Earl. And sharrows as they were mostly placed in this project are pretty redundant, but they’re definitely graphically better than the earlier tiny stencils. Too bad I mostly see them on bike boulevards where we’re not being threatened (much). Still wondering why residents in MI are paying for bike signage in OR?? That’s where Coburn is aiming. If Coburn’s asking for a multilateral division of the US, then he better be careful what he wishes for: The tribes won’t hesitate to leave Oklahoma entirely under such a division, and Oklahoma would be on it’s own to rebuilt the snarl of highways it has. Otherwise, we’re all in this together. A better question is why Coburn’s giving California carte blanche in his criticisms. $130,000,000 spent already on planning the CRC – another $3,870,000,000+ to come, and Coburn is poking at $900,000? Sigh. It never ceases to amaze me that way the Portland ultra-left wingers can spin anything. This is a waste of money, period. After all, we can’t get the potholes in our roads repaired, fix decrepit bridges, etc. And the so-called “liberals” and “progressives” spend most of their time dreaming up new excuses to close local schools and bus kids further and further. I’m curious if they have a plan for how they plan to pay Russia and China back the $900k the federal government had to borrow to do this. Not likely… It’s always someone else’s responsibility. Hi Brian. Thanks for injecting some humor into the discussion.